Defending champion Bishop Miege remains the frontrunner to win a second consecutive 4A-I crown. The Stags may have lost all-state quarterback Ryan Willis and his 3,000 passing yards, but sophomore Carter Putz has thrown for nearly 1,800 yards and 17 touchdowns already this season. Add in all-state weapons like running back Dawson Downing (783 yards rushing, 16 TD) and receiver Jafar Armstrong (39 rec, 663 yards 8TDs) and the Stags will once again be a tough out. They are not one of the three remaining unbeaten teams in the classification, however. Miege fell 42-35 to Blue Valley earlier this season. Second-ranked Buhler and unranked Abilene and Atchison are the only undefeated teams remaining in 4A-I. Buhler being undefeated isn’t really a surprise give a roster including the dynamic duo of Dillon Engaelland and Jace Williams. Abilene and Atchison, on the other hand, have great playmakers in that position in Harley Hazlett and Wykeen Gill. Half of the 32 teams in the classification have at least a 4-2 record heading into Week 7 action. Atchison (6-0) – Atchison is 6-0 and the champions of the KCAL title again this season. The Redmen average nearly 54 points per game behind senior Wykeen Gill. Gill has passed for 1,059 yards and 13 touchdowns, and rushed for 620 yards and 13 more scores. Parker Welch has added 309 yards and nine scores on the ground. Bryce Enzbrenner has 21 receptions for 481 yards and five touchdowns. Basehor-Linwood (3-3) – Two of Basehor’s losses have come in close games to Baldwin (21-19) and unbeaten Bonner Springs (27-21). On the other side, the Bobcats needed overtime to top KC Turner, 30-29 in Week 4. Justin Phillips has passed for 783 yards and eight scores for Basehor-Linwood. Chas Rollo leads the Bobcats with 336 yards on the ground and four scores. Tonganoxie (3-3) – The Chieftains have lost three of four after opening the season with wins over Perry-Lecompton and KC Turner. Jordan Brown has rushed for 455 yards and seven touchdowns, while throwing for 387 more yards and four scores. Tonganoxie missed the playoffs in 2014 after reaching the second round in 2012 and 2013. KC Piper (2-4) – The Pirates are 36-18 under Chris Brindle since his arrival in 2011. Piper has just two wins this season against Bishop Ward and KC Turner. Bishop Miege (5-1) – Defending champion Miege is the heavy favorite to repeat this season. Sophomore quarterback Carter Putz has completed 68.5 percent of his passes for 1,781 yards and 17 touchdowns. Jafar Armstrong has 39 catches for 663 yards and eight touchdowns, while Nolan Gray has 28 catches for 494 yards and three scores. Dawson Downing is one of the state’s best, and despite missing some time due to injury, he has 783 rushing yards and 16 scores. Louisburg (5-1) – Louisburg’s streak of 12 consecutive playoff appearances ended with a 3-6 season in 2014. Senior quarterback Austin Terry leads a Louisburg offense that averages 32 points per game. The Wildcats’ only loss came 11-10 to rival Paola in Week 4. KC Sumner Academy (4-2) – Sumner has finished 2-7 in each of the past four seasons, but the Sabres have already doubled win total for those seasons. The competition is going to get substantially tougher in this district for the Sabres, who will have to adjust. Spring Hill (1-5) – The Broncos’ lone win came 23-18 over Baldwin in Week 4. Spring Hill has to be more consistent on defense as the Broncos are giving up nearly 42 points per game. De Soto (4-2) – Brian King’s Wildcats have lost to unbeaten St. James Academy (26-10) and a 5-1 Louisburg team (43-28). De Soto is looking to return to the playoffs for the first time since 2012 after posting just a 3-15 combined record in 2013 and 2014. Ottawa (4-2) – After a nine-year drought, the Cyclones have reached the playoffs in each of the past two seasons under Rob Hedrick. Ottawa averages just over 21 points per game, while giving up 17. The Cyclones have lost 10-7 to Paola and won 19-16 over Santa Fe Trail in the past two weeks. Eudora (3-3) – The Cardinals are 3-3 in Phil Katzenmeier’s first year as coach. Eudora dropped its first three games to opponents that are a combined 16-2, but have since won three straight. Quarterback Grant Elston is an explosive player for the Cardinals. Elston rushed for 200 yards and passed for 102 yards with five combined touchdowns in Eudora’s 59-22 win over Spring Hill last week. Baldwin (2-4) – The Bulldogs have lost four straight games after beginning season with consecutive close wins over Basehor-Linwood (21-19) and KC Piper (27-26). Baldwin then dropped a 6-point decision to Perry-Lecompton and a 5-point decision to Spring Hill. Four of the Bulldogs’ six games have been decided by six points or less. Baldwin has a streak of eight consecutive playoff appearances on the line. Key Games: All games are crucial in a wide open district. Fort Scott (5-1) – The Tigers’ only loss came 37-0 to undefeated Pittsburg. Fort Scott has only given up 41 points in their other five games. Kaleb DeLaTorre has passed for nearly 800 yards on the season and typically looks to Marcus Stepps who has more than 400 yards receiving. Carter Young leads the Tigers with 394 rush yards and seven scores, while Wyatt Tourtillott has 334 yards and three scores. Paola (5-1) – Paola’s only loss came 23-7 to De Soto in a game where the Panthers were bit by the turnover bug. Paola has won four straight since that setback, including three wins by seven points or less. Poala defeated rival Louisburg 11-10 back in Week 4. Senior Ryan Gleghorn directs the offense, while Nathan Staats has had some big games out of the backfield. Labette County (3-3) – The Grizzlies are playing well under new coach Sean Price. Labette County has won three consecutive games by averaging 50 points per game in that span. Junior quarterback Logan Dean has passed for 1,560 yards and 18 touchdowns. Klein Ryan came out for football for his senior season, and has adapted by catching 39 passes for 735 yards and ten touchdowns. Fellow senior Dominic Johnson has 31 catches for 535 yards and five scores. Chanute (1-5) – After graduating a talented class last fall, the Blue Comets are just 1-5 this season. Chanute has lost to Independence 32-27, and Parsons 27-20 in double overtime in the past two weeks. Senior Kenton Richards is a dynamic athlete that has passed for 778 yards and seven touchdowns, while rushing for 552 yards and six more scores. Augusta (5-1) – Last season, Jason Filbeck led the Orioles to the playoffs after a four-year drought. The challenge now is to reach the postseason in back-to-back years for the first time since 2004 and 2005. Augusta’s only loss came 47-21 in a Week 4 showdown with No. 2 Buhler. The Orioles have solid wins over Wellington, McPherson, and Galena. Junior Zach Barclay directs the Augusta offense from his quarterback position. Braclay’s classmates Luke Dockers and Raef Hilt are Augusta’s leading rushers. Independence (4-2) – The Bulldogs had their three-game winning streak stopped in a 31-14 loss at Fort Scott last week. 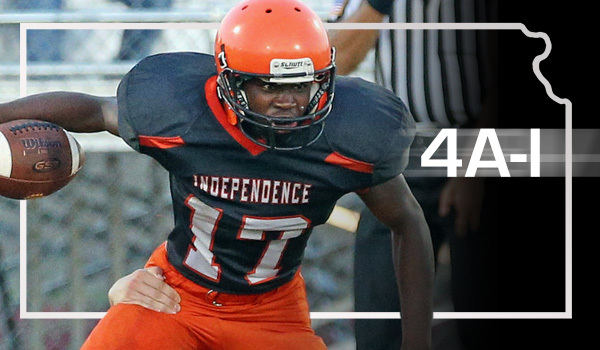 Independence trailed 17-0 until the fourth quarter when they traded a pair of touchdowns with the Tigers. Indy averages 23.5 points per game, while surrendering 27.7. Winfield (2-4) – The Vikings’ two wins have come against winless Rose Hill and 1-5 El Dorado. Brett Roark leads the offense with 374 passing yards and two touchdowns, while rushing for 223 yards and four scores. Nathaniel Gale has rushed for a team-high 247 yards, while Adam Keller has scored four rushing touchdowns. Coffeyville (0-6) – Typically a high-scoring team, Coffeyville has struggled this season on the offensive side of the ball. The Golden Tornado have averaged just 8 points per game this season, and have been shut out three times. Dillon Humble has passed for more than 500 yards and six touchdowns, but has been intercepted eight times. The ‘Nado average just two yards per carry on the ground. Coffeyville has reached the playoffs in each of the past seven seasons. Andover Central (5-1) – The Jaguars have nearly matched last season’s win total from a 6-5 year in 2014. Andover Central has a bevy of weapons, including quarterback Payton Huslig, Jordan Birch, and all-purpose threat Darraja Parnell. One of the state’s best offenses, Andover Central has averaged 40.2 points per contest, up from 30 a game in a 3-3 start in 2014. Huslig has passed for 968 yards with a 12 touchdowns and three interceptions, while Parnell has 28 catches for 785 yards and 11 scores. Topeka Hayden (5-1) – Hayden’s only loss came 26-14 at Washburn Rural in Week 2. The Wildcats came back to collect a quality 21-14 victory versus Manhattan the following week. Quarterback Dallas Crittenden has thrown for 872 yards and eight scores. Connor Schumacher is a multi-purpose threat with 416 rushing yards and 257 receiving yards. El Dorado (1-5) – El Dorado has had big offensive struggles with no more than 16 points in any contest. Its lone win is a 14-7 victory at Rose Hill. Towanda-Circle (0-6) – Circle has not had any game within 17 points. The T-Birds’ season high for points came in a 32-14 home loss versus Chapman in the season opener. Ulysses (5-1) – The Tigers lost the GWAC title with a 35-0 home loss to Scott City last week. Tiger senior running back Ian Rudzik, the state’s No. 2 rusher entering last week, finished with 29 rushing yards last week. Rudzik had averaged 246 rushing yards a contest. Ulysses, a top-5 team in 4A-I entering Friday, had tallied at least 27 points in every game before the loss. Mulvane (3-3) – Sophomore Jayden Price has emerged as another quality Mulvane quarterback. The Wildcats have losses to unbeaten squads Buhler and Collegiate and fell 27-7 at Andale last week. Mulvane has three wins by at least 14 points. Welllington (3-3) – Like Mulvane, Wellington has taken losses at Andale and versus Collegiate with a combined score of 81-8. It also fell 25-14 at Augusta in Week 1. In its three victories, Wellington has tallied 36, 58 and 34 points. Rose Hill (0-6) – The Rockets have struggled mightily with just one game closer than 19 points. Rose Hill hasn’t scored more than 14 points in a contest. Key Games: While Ulysses has shown some weaknesses, especially in a close early-season win over Hugoton and last week’s blowout against Scott City, the Tigers remain the favorite. (Wk 8) Mulvane at Wellington will decide the runner-up spot. Abilene (6-0) – Abilene started 6-0 last season before it went 0-3 in district play. Abilene’s numbers are virtually identical after six games compared to 2014. Last year, the margin was 192-49; this season, it’s 195-46. Abilene has ranked No. 1 in the classification in scoring defense, but slipped to No. 2 behind Buhler last week. Buhler (6-0) – The Crusaders, long known for offense, has displayed great defense this season with just 41 points allowed and three shutouts. The Black Knight defense keyed a 16-0 season-opening victory against Andale, the first win for Buhler against its rival in 25 years. Quarterback Jace Williams and running back Dillon Engelland lead the offense. McPherson (4-2) – The Bullpups opened the Jace Pavlovich era with a quality 14-7 home victory against Salina South before losses at Andale and versus Augusta. McPherson, who won this district with a plus-20 margin in 2014, tallied 30.7 points per game and allowed 24.8. This season, the Bullpups have averaged 25 a contest and allowed 12.7 a contest. Senior running back Noah Jirgens has more than 700 rushing yards. Hays (2-4) – The Indians have completely changed from Bo Black’s high-octane spread offense behind Alex Delton (now at K-State) in 2014 to a power-running, defensive-minded effort with Randall Rath. The Indians have road shutouts against Liberal and Wichita South, a 5-1 program, but have had major problems scoring against the classification’s toughest schedule. Last season, the Indians started 6-0 and averaged 44.3 points a game and allowed 21.7. This year, HHS has tallied 16.7 points a contest and allowed 23.